US company Livid Instruments are nothing if not productive and inventive. 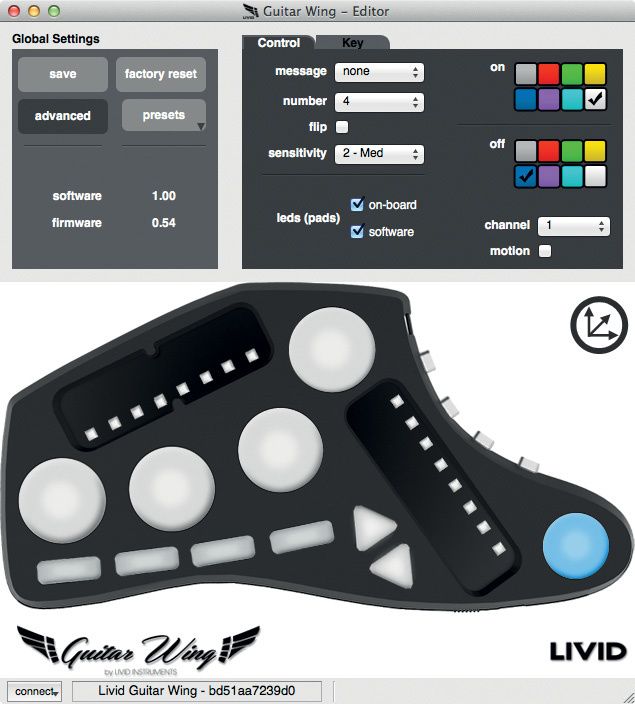 Founded in 2003 by ex-Sinch guitarist Jay Smith, Livid’s initial goal was to build on his first MIDI controller (the video-mixing Viditar) and, initially, to use a guitar-based form factor for MIDI-driven audio and video control surfaces. Unfortunately, it seems that the market back then wasn’t quite ready to embrace Livid’s concepts. However, fast-forward to the present day where computer-generated sounds have become part of almost every genre of music, and where control surfaces are often the primary interface between human, computer and creativity, and maybe the world is finally ready for Livid’s vision. 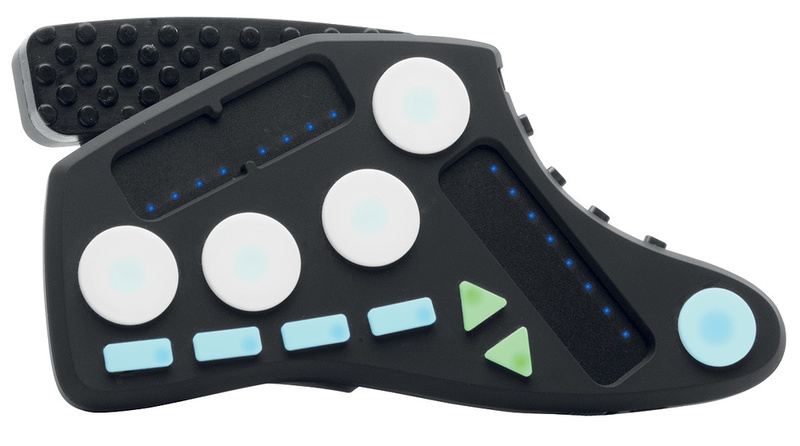 Controlling MIDI devices from a guitar (or a guitar-shaped controller) has been both the holy grail and the downfall of many a company in the past. Having virtually completed the development work on their latest product, the Guitar Wing, in January 2014, Livid Instruments successfully called on crowd funding through Kickstarter to gauge demand and finance production. 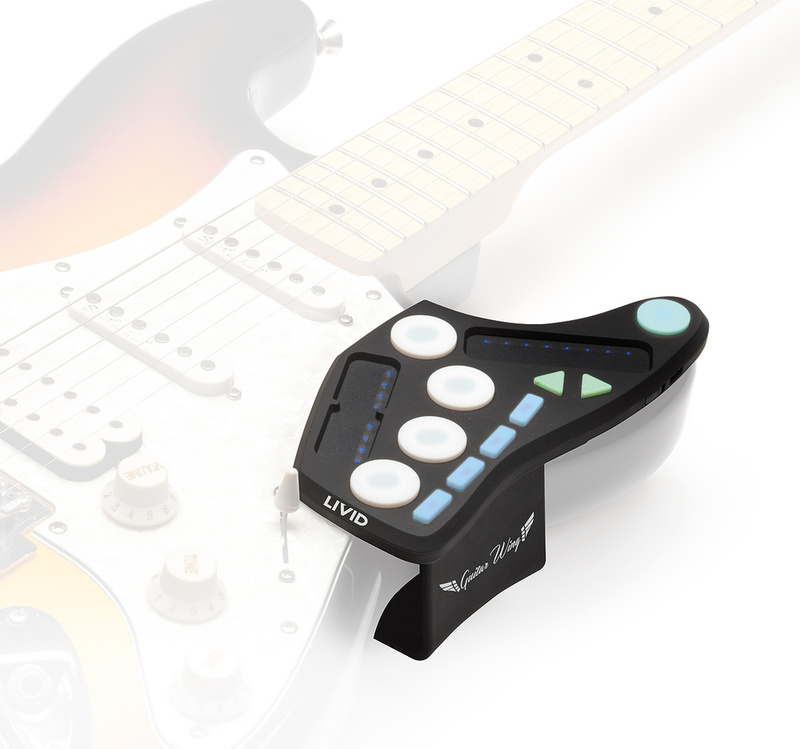 The Livid Guitar Wing is a wireless (Bluetooth) MIDI control surface designed to clamp easily onto the body of an electric guitar. Controls comprise four circular pads that output note on/off and continuous controller (CC) aftertouch messages; four rectangular function buttons; two arrowed ‘direction’ buttons and four side-mounted buttons, all of which send note on/off information; and two recessed touch-sensitive fader strips — one long, single segment and the other split into two segments — that send CC messages for position and note on/off information when tapped. A fifth pad on the horn of the Guitar Wing is normally used to enable the device’s built-in three-axis accelerometer that can send differing note on/off or CC messages on any or all axes, however all other pad functions are possible. Switched off, the Guitar Wing is somewhat unprepossessing, being simply a black plastic device with a bunch of white pads and buttons. Switch it on and not only do the RGB LEDs underneath the pads and buttons illuminate, but also lines of blue LED ‘runway’ lights come on to indicate fader position. The Guitar Wing receiver is a USB device that can be connected either to the USB port of a computer or to that of a MIDI USB host. If you haven’t come across one before, a MIDI USB host is a box, equipped with MIDI In and Out sockets, into which you can plug a class-compliant USB MIDI device such as the Guitar Wing receiver. MIDI messages received from the USB device will be sent to the MIDI Out, and MIDI messages received at the MIDI In will be sent to the USB device. Using a USB MIDI host would enable you, for example, to use Guitar Wing to wirelessly control hardware preamps and effects units without the need for a computer, which could be most useful, especially on stage. The Guitar Wing receiver is plug-and-play and class compliant with OS X, Windows, Linux, iOS (via the camera connection kit) and any USB MIDI host. Power to the Guitar Wing comes courtesy of an onboard rechargeable lithium-ion battery. Recharged by a micro-USB cable that can be connected to any 5V DC charging source, the Guitar Wing has a claimed eight-hour operating life when fully charged. Although you can use your computer to charge the Guitar Wing, there is no data transfer between the two devices. Available as a free download from the Livid Instruments web site, Wing FX is a cross-platform software package that runs under Mac OS 10.8 (or higher) and Windows 7 (or higher). Offering instant access to effects, filters, samples and more, Wing FX can be run stand-alone or as an AU (32-/64-bit) or VST (32-bit) plug-in and is specifically mapped to the Guitar Wing’s factory default settings. Additionally, Livid provide a selection of templates that integrate Guitar Wing with Ableton Live 9, Apple Logic Pro X, Apple Main Stage, Bitwig Studio, Cycling ’74 Max, NI Guitar Rig, NI Traktor 2 and Propellerhead Reason. The number of templates and their functionality varies by program, but they do give you a good place to start experimenting. The Editor software allows you to precisely define the Guitar Wing’s controls.The final piece of software is the Guitar Wing Editor, Version 1 of which has been released recently. The Editor gives you the ability to set each pad, switch or fader to send whatever MIDI message types and values it is capable of sending on whichever channel you choose (Omni is not an option). There are a few operational niceties to keep in mind. Pads and faders can send both control and switch messages (control messages are note, CC, bend and touch). The four switches and the three fader switches can be set to momentary or on/off and can send note and CC messages plus program changes. Pad switches can be set to send either a fixed value or a pressure-dependent value when activated, whereas fader switches are set to fixed values. Finally, any switch can be set to control the accelerometer and any pairing of two identical eight-colour RGB LED palettes can be used to signify activation and deactivation of a control. Fitting the Guitar Wing to my Strat had to be the most painless installation of MIDI hardware on a guitar in the known universe. It fitted perfectly straight out of the box, and there is certainly enough flexibility and spring in the unit’s clamp to cope with a Les Paul or a guitar of similar thickness. If you don’t have a Strat or Les Paul (or a similarly shaped guitar and/or bass) adjustment of the relative position of the control surface to the clamp enables you to position the Guitar Wing on your guitar in the most secure and aesthetically pleasing position possible. Flying V owners should note that the Guitar Wing can’t cope with every guitar! Pairing the Guitar Wing to its USB Bluetooth receiver is simply a matter of plugging the receiver into your computer and switching on the Guitar Wing within 20 seconds, at which point it appears on the list of available MIDI controllers. The Wing FX program downloaded from the Livid web site and installed on my Mac (OS 10.9) and PC (Windows 7) perfectly, placing the VST and AU plug-ins into the correct folders automatically. For the integration template I chose the Native Instruments Guitar Rig route, as I’d just upgraded to Version 5 on both Mac and Windows platforms. Livid provide an excellent hard-copy Quick Start guide in the box, and their detailed and comprehensive Guitar Wing operation and integration manuals can be found through their wiki page at http://wiki.lividinstruments.com/wiki/Main_Page. I’d recommend reading the documentation thoroughly as it contains all the information you’ll need to get the Guitar Wing up and running. Put simply, the Guitar Wing and its software work as advertised. They do what they are claimed to do effectively and without fuss. Both stand-alone and as a plug-in, the free Wing FX program is easy to use and sounds pretty good, although the distortion is not to my personal taste. To me, the program’s real value was in getting me used to the Guitar Wing without having to worry about setup parameters in other bits of software. Once I’d got accustomed to the pads and switches and edited them to taste, I got stuck into Livid’s Guitar Rig 5 preset and stayed there for quite a while. The Guitar Wing in its detached state with the rubber clamp visible in the background. Rather than me describing all the fun that I had and how well the Guitar Wing worked with Guitar Rig, you’d be better off watching the numerous videos on the Livid Instruments’ web site and on their lividTV Youtube channel. You’ll not only find Moldover going through Livid’s GR5 preset (he had a lot to do with the development of the Guitar Wing), but also you’ll discover demonstrations with other programs and instructional overviews. Overall I found the Guitar Wing to be easy and convenient to operate, and the issues that I came across are, I think, possibly more personal than anything else. The biggest thing to get used to (for me) was having to constantly take my right hand off the guitar to operate the Guitar Wing. I’m more accustomed to MIDI pedalboards and would normally gravitate towards something like Keith McMillen’s Softstep 2 if I were looking for similar functionality to the Guitar Wing. However, a bit of left-hand readjustment in the hammer-on/pull-off department (it’s amazing what you can do when you try), and all was well in the note production department. Because of the height and angle at which I position my Strat, I found that I couldn’t see the blue LED lights on the long single fader strip. From my point of view, the LEDs are on the wrong side of the fader and are obscured by the wall of the recess so, personally, I’d like them on the other side where I’d be able to see them. The final issue was comfort. The Guitar Wing’s clamp sticks out behind the guitar by about 20mm or so and, because of the way that I hold my Strat, its presence was more than noticeable. However, because the clamp is removable, replacing it with a couple of bits of Velcro between the Guitar Wing and Strat scratchplate would be a simple solution. The Guitar Wing is a great concept and by the end of the review process I’d become very impressed by it. The complement of pads, switches and faders are well chosen and well positioned, making it a very useful and usable wireless MIDI controller. Pairing the Guitar Wing with more extensively featured MIDI control surfaces and/or pedalboards would open up even more creative avenues to explore. I could also see DJs and singers making great use of it, especially on stage. The Guitar Wing isn’t going to be for everyone, but its price puts wireless MIDI-based performance control into the mainstream. If that’s your thing, then the Livid Instruments Guitar Wing is an essential audition. The free software is very good, especially the integration templates for some major programs. Excellent wiki for manuals and other information. A cost-effective way of freeing guitarists from their MIDI pedalboards — for some of the time at least. Requires a free hand to operate it, so technique readjustment may be required. The long fader’s LED ladder can be difficult to see, depending on guitar position. The rear portion of the clamp can be a bit obtrusive, again depending on guitar position. The Guitar Wing might not be for everyone, but anyone (even non-guitarists) who uses MIDI control in a performance environment should take a look at it.